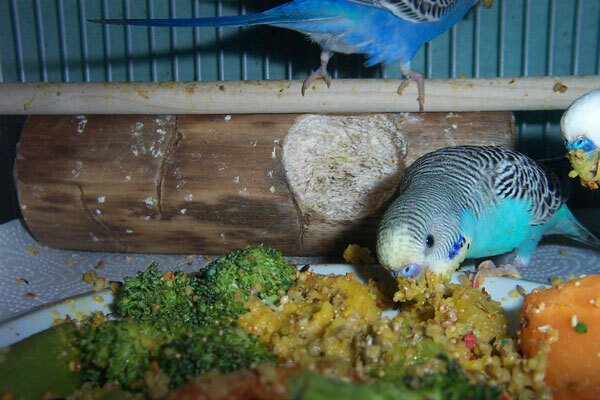 Our Best Parakeet Food is a wonderful blend of nuts, fruits, seeds, vegetables, herbs and bee pollen made specifically for parakeets. 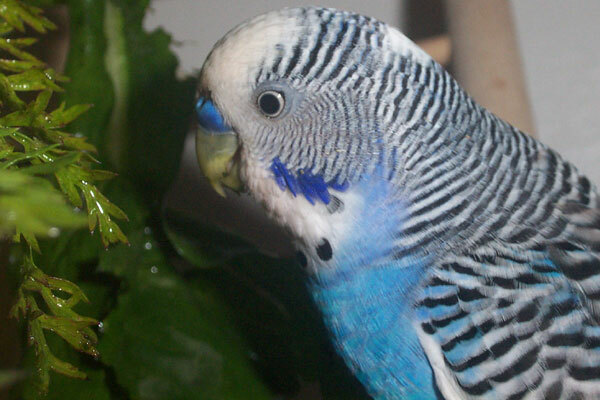 This blend is so plentiful in vitamins and minerals and the appropriate amount of protein, that it takes the guesswork out of feeding your parakeet. All natural bird seed, fruits and nut blend. Human-grade quality ingredients that you can actually pronounce. Freshest, most delicious-smelling bird food available. 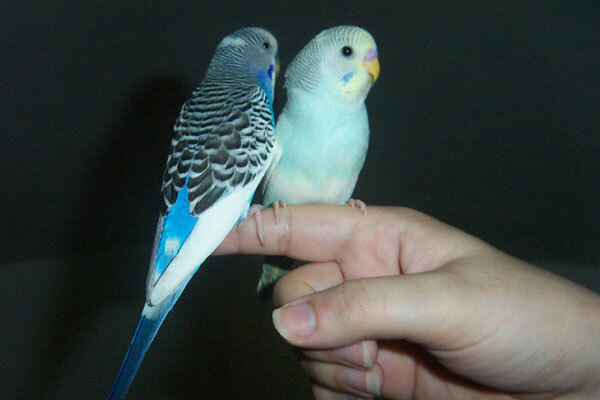 Be sure to get the smallest size - for budgies (crumbles, mash). Pellets are taken best when soaked in sugar-free fruit juice and bleneded into a mash with their favorite seeds and fruits & veggies. 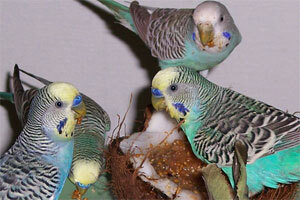 Budgies will rarely eat from a bowl of plain dry pellets. Specially steam-pelleted food designed to retain beneficial nutrients while eliminating harmful bacteria. 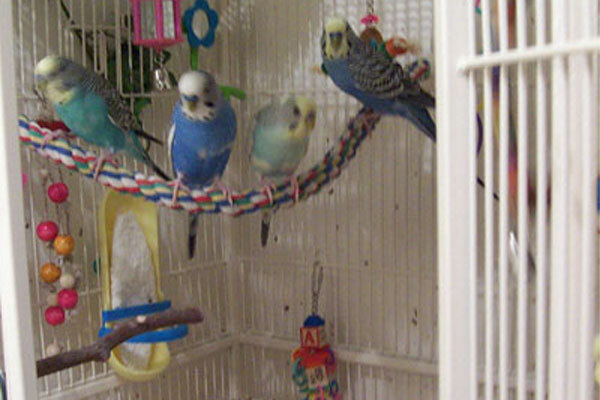 Give your birds the nutrition they need with no artificial colors or flavors and no animal by-products. 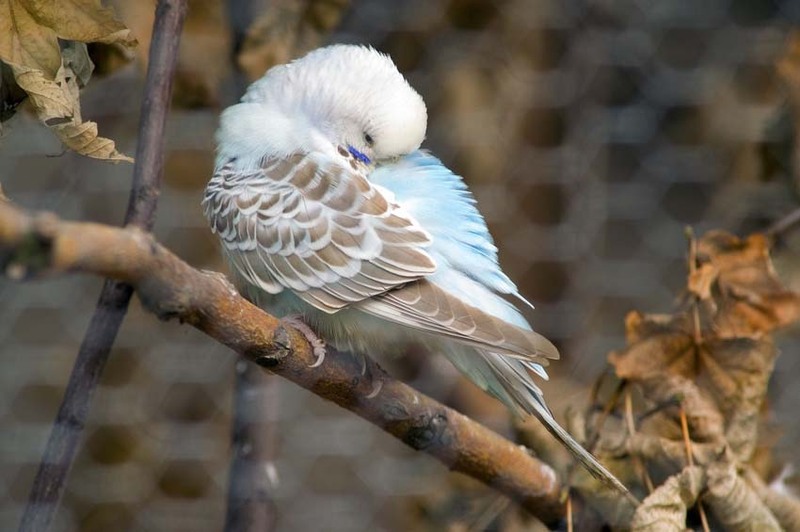 Harrison's Bird Foods is a family of certified organic, formulated diets that were created by avian veterinarians and top avian nutritionists with the health of your bird in mind. 100% Certified Organic Ingredients: Rice, hulled millet, barley, alfalfa leaf, sunflower seed hulled, sesame seeds unhulled, quinoa whole, buckwheat hulled, dandelion leaf powder, carrot powder, spinach leaf powder, purple dulse, kelp, rose hips powder, rose hips crushed, orange peel powder, lemon peel powder, rosemary whole leaf, cayenne ground, crushed red chili peppers, nettle leaf. No artificial anything. No sucrose/sugar added. The eight exotic cuisines contain wholesome ingredients like sea kelp, organic couscous, basmati rice, papaya, apples, cranberries, lentils, dates, tomatoes, anise, ginger, organic quinoa and more! 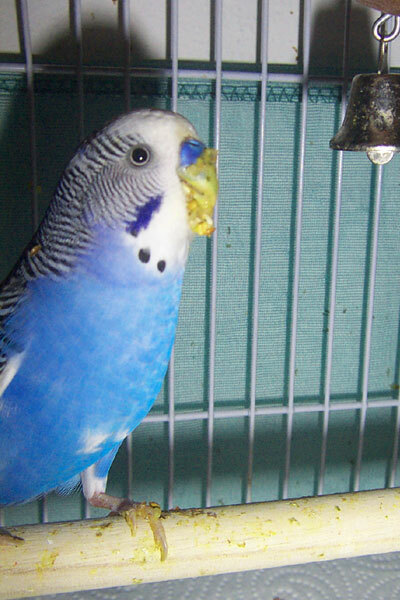 Patience and persistance is key in trying to get your budgie to try new foods. It may take a few weeks for them to figure out that the new weird thing isn't going to eat them. A great way to get them to try new foods is to give them a "mix" every day - filled with fruits & veggies & pasta & seeds & pellets soaked in fruit juice, all chopped up fine. A mix will always look pretty much the same so you can pop new & interesting foods in there & the budgies won't be scared of it. 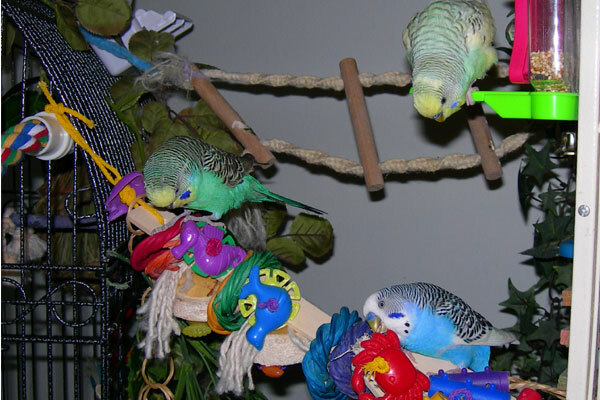 Another trick - for leafy greens & such, is to make them seem like a toy - make them fun - weave the leaves through the bars of their cage, or hand them down over perches. Put leafy greens in a shallow bowl filled with clean water. As they bathe, they will nibble on the greens. 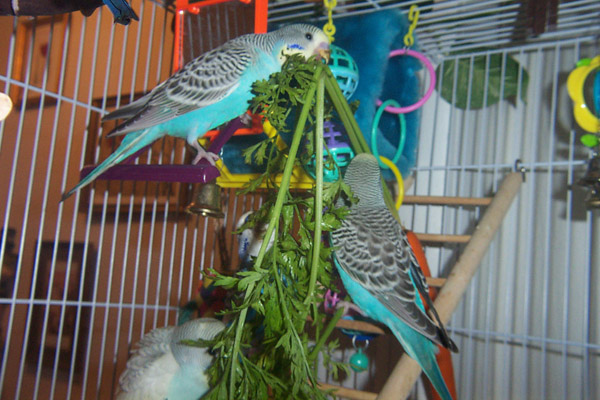 Soon, they will get super excited when you bring leafy greens into the room. My guys favorites are dandelion greens, carrot tops & kale. You can get the grains cheap in bulk at a store like WholeFoods. Put pellets in a bowl and add enough water to cover. Microwave for 20 seconds until mush. Add other ingredients in casserole dish. Stir well and serve. Make sure food has cooled appropriately. We make up a casserole dish of budgie mix a couple times a week and store it in the fridge. Cut coconut in half and remove milk. In mixing bowl, combine baby food, oat groats, blueberries, and quinoa. Stir well, but not vigorously, the blueberries should remain whole. Fill coconut halves with mix. Top each half with 3 pieces of carrot greens. Serve fresh. Feeds a small flock. 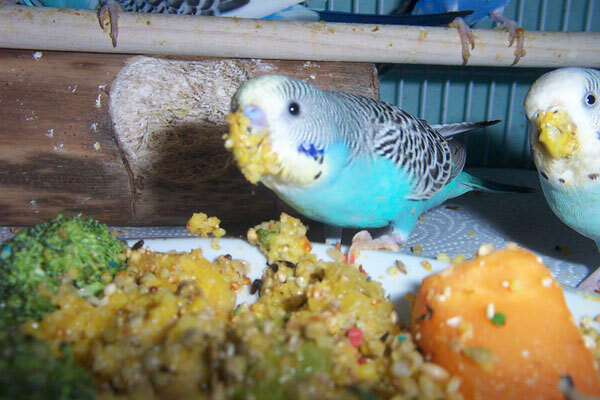 Hundreds of heathy simple recipes for yummy food you can make for your budgies at home!